For more than two decades time-resolved vibrational spectroscopy (TRVS) was only part of general conferences on solid-state physics, molecular spec- troscopy, photochemistry and photobiology. It was in 1982 when the first meeting on TRVS was organized at Lake Placid. The conference met a strong need among the workers in the field, and it was decided to continue with spe- cial conferences on this topic. 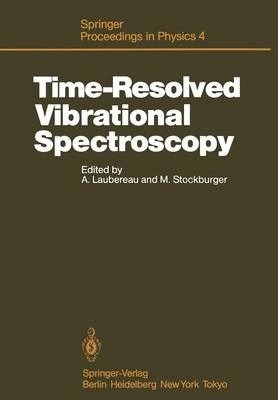 The 2nd International Conference on Time-Resolved Vibrational Spec- troscopy was held June 3-i, 1985 at Bayreuth-Bischofsgrun, Germany. Sci- entists from many disciplines came together to discuss their common interest in time-resolved techniques and spectroscopic applications. The high qual- ity of the research presented, the enthusiasm of the participants, and the attractive surroundings combined to an enjoyable atmosphere. Ample time for discussions and the limited number of participants (approximately 100) stimulated the formal and informal exchange of ideas. "\'umerous people helped to make the conference run smoothly. Special thanks are due to Mrs. Lenich for making the technical arrangements, and to the program committee for the selection of the scientific presentations. The meeting has benefited from several financial souces. The generous sup- port by the Emil-Warburg-Stiftung was particularly helpful. Financial aid of the "Deutsche Forschungsgemeinschaft" and of the "Bayerisches Staatsmini- sterium fur U nterricht und K ultus" is also gratefully acknowledged. Illustrations note 81 Illustrations, black and white; XI, 304 p. 81 illus. I Techniques and Instrumentation.- Energy-Partitioning Measurements in O(1D2) Reactions Time-Resolved Fourier Transform Infrared Emission Spectroscopy.- High-Resolution Fourier Transform Raman Spectroscopy with Ultrashort Laser Pulses.- Picosecond Transient Raman Spectroscopy Using the High Repetition Rate, Amplified, Synchronously Pumped Dye Laser.- Pulsed Multichannel Raman Technique.- Fluorescence Rejection in Raman Spectroscopy.- Measurement of the Third-Order Electronic Susceptibility of GaP by Picosecond CARS Spectroscopy.- Polarization Effects of Time-Resolved Coherent Raman Scattering in Liquids.- II Vibrational Dynamics of Molecules.- Ultrafast Intramolecular Vibrational Redistribution and Intermolecular Energy Dissipation of Polyatomic Molecules in Solution.- Time-Resolved Observation of Vibration ally Highly Excited Polyatomic Molecules.- Time-Resolved Raman Spectroscopy of Highly Excited Vibrational States of Polyatomic Molecules.- Transient Vibrational Excitation of Dye Molecules in a Solid Polymer Matrix.- Ultrafast Vibronic Dynamics of Dye Molecules Studied by the Induced Grating Method.- Vibrational Fluorescence from Matrix-Isolated CO and NO Pumped with a Color Center Laser.- Vibrational Energy Decay of Surface Adsorbates.- Vibrational Energy Relaxation of Hydrogen Chloride in Liquid and Solid Xenon.- Ultrafast IR Spectroscopy Studying Nearly-Free Induction Decay.- Dephasing in Liquid N2 and in Binary Mixtures of N2 with Liquid Argon.- High Pressure Brillouin Scattering on Liquid Carbon Tetrachloride and Benzene.- III Vibrational Dynamics in Solids.- Vibrational Energy Relaxation in Solid Benzene.- Time-Resolved Raman Spectroscopy of Laser-Heated Semiconductors.- Picosecond Vibrational Dynamics of Hydrogen Bonded Solids: Phonons and Optical Damage.- Time-Resolved Two-Color Optical Coherence Experiments.- High Sensitivity Time-Resolved Study of the Coherence and Parametric Instabilities of Two-Phonon States.- Two-Phonon Bound States in Molecular Crystals.- IV Photochemical Reactions.- Resonance Raman Studies of Transient Intermediates in Photoreactions of Anthraquinone and Flavone Species.- Resonance Raman Spectra and Assignments of Deuterated Stilbene Anion and Cation Radicals.- Application of Time-Resolved Resonance Raman Spectroscopy to Some Organic Photochemical Processes in Solution.- Time-Resolved Resonance Raman Studies of Photoenolization of ortho-Alkyl Substituted Benzophenones.- Resonance CARS Spectra of Metastable Merocyanines Produced by UV-Photolysis of Spirooxazines.- Photoisomerization of Stilbene and 1,4-Diphenylbutadiene in Compressed Gases and Liquids - Density-Dependent Solvent Shift and Transport Contributions.- V Transient Species.- Advantages of Resonance CARS for the Study of Short-Living Radicals and Photoisomers.- Resonance CARS Study of ?, ?-Diphenylpolyenes in the Electronic Excited States.- Ultraviolet Resonance Raman Studies of Electronic Excitations.- Excited States of Polyenes Studied Time-Resolved Resonance Raman Spectroscopy.- Resonance Raman Spectra of the Triplet States and Anion Radicals of Trans-Nitrostilbenes.- Resonance Raman Spectroscopy of Transient Species in the Pulse Radiolytic Oxidation of Aqueous Aniline.- Intramolecular Kinetics of Vibrationally Excited Singlet and Triplet States in Some Cyclic Hydrocarbons.- In Situ Raman Studies of Homopolymerisation and Copolymerisation Reactions.- Time-Resolved Spontaneous Raman Scattering Chrysene in S1 and Incoherent CARS for T2 Measurement.- VI Biological Systems.- How Protein Structure Controls Oxygen Dissociation in Haemoglobin: Implications of Picosecond Transient Raman Studies.- Resonance Raman Spectra of Reaction Intermediates of Herne Enzymes.- Herne-Linked Ionization of Horseradish Peroxidase Compound II Monitored by Changes in the Fe(IV)=0 Resonance Raman Frequency.- Resonance Raman Studies of Transient States in Bacterial Reaction Centers.- Energy-Transfer Between Dimeric Chlorophyll ? and All-Trans ?-Carotene in vitro as Resolved by Fluorescence Photoquenching.- Using Time-Resolved Resonance Raman Spectroscopy to Map the Reaction Pathway for Enzyme-Substrate Transients.- UV, IR, and Raman Spectroscopic Tracings of the B?Z Transitions of Poly[d(GC)]*poly[d(GC)].- Kinetic Studies on Bacteriorhodopsin Resonance Raman Spectroscopy.- Resonance Raman Study on the Role of Water in Bacteriorhodopsin.- Picosecond and Nanosecond Resonance Raman Evidence for Structural Relaxation in Bacteriorhodopsin's Primary Photoproduct.- Picosecond Time-Resolved Resonance Raman Spectroscopy of Bacteriorhodopsin Intermediates.- Evidence from FTIR-Measurements for a Separation of the Protonated Schiff Base from the Counterion into a Less Polar Environment.- Time-Resolved Infrared Spectroscopy Applied to Photobiological Systems.- VII Theoretical Aspects.- Electrontransfer and Vibrational Relaxation in Bridged Donor-Acceptor Systems.- Theory of Luminescence in the Three-Level System with Extension to the Multistate Problem by Transform Methods.- Application of Time-Dependent Raman Theory to the Analysis of Inorganic Photosystems.- Time-Dependent Quantum Dynamics of the Picosecond Vibrational IR-Excitation of Polyatomic Molecules.- Decay Law in Conformational Relaxation.- Stochastic Theory of Vibrational Dephasing and Transient CARS Lineshapes.- On the Lineshape of Molecular Aggregate Spectra.- Index of Contributors.